In upcoming weeks we will discuss other Google tools and share more tips and tricks. See previous “Google Tips” in the 6-TECH Tips section (right panel) of ITS News. Hangouts is Google’s free video conferencing tool, allowing people to see, hear and/or chat with each other in real-time. It is an easy-to-use collaboration tool, which can currently accommodate up to 15 participants. 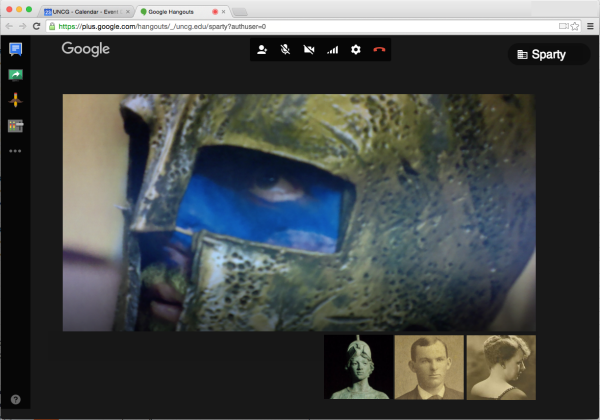 When you create a meeting in iSpartan Calendar and invite guests, Google provides an option to Add video call. Choosing this will add a link to a Hangout video call in your event. You can change the name of the Hangout by clicking Change name directly beneath the video call link. 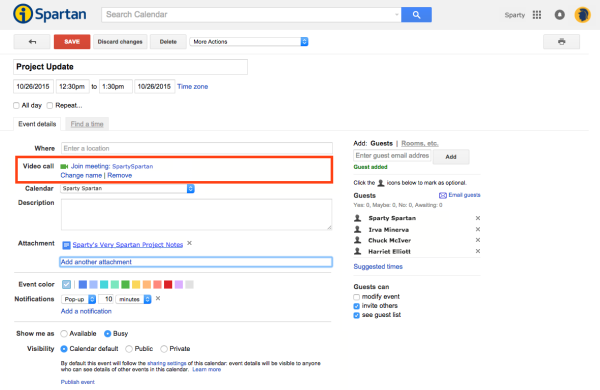 The Add attachment feature of Calendar enables event planners to associate a file (such as a meeting agenda) with an event and then share it with invitees. You can attach a local file, or you can take advantage of the integration with Google Drive and easily access and select a file to attach from a Google Drive folder. 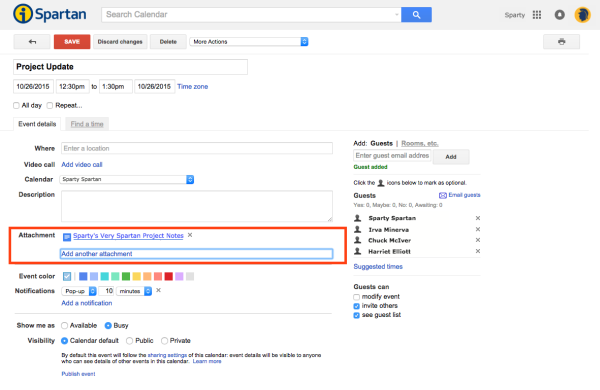 To add an attachment, with Calendar open click Create. Complete as much or as little of the event information as you wish before you scroll down to the Attachment field and click Add attachment. The “Select a File” screen will appear with options to navigate files in your Google Drive or Upload files from your computer. 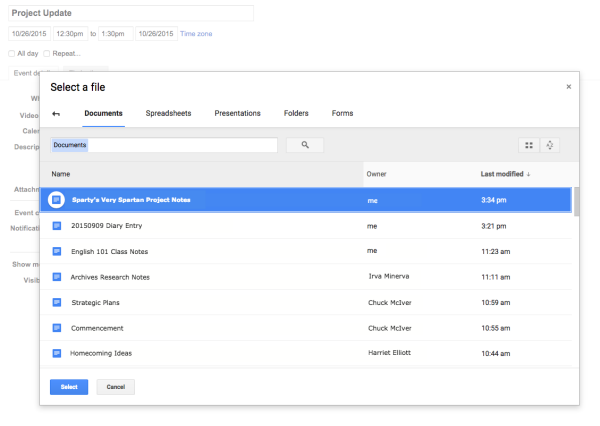 Example: Select Google Drive to see Drive files organized by type (Documents, Spreadsheets, etc.). Click Select to add the file as an attachment. The file will then be displayed in the Attachment field on the event creation screen (if more than one file is attached, a list of files will be displayed). Note: When you Save the event, if there are any Google Drive files you have attached that are not already shared out to the invitees, you will prompted with a message asking if you wish to grant access to the file to all invitees. 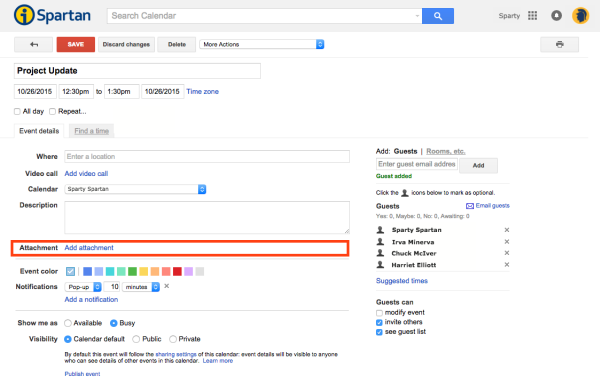 For more information about Google Calendar, FAQ and links to resources, see About Google Calendar. Want to discuss how UNCG is making use of Gmail or other Google applications? Do you have favorite tips and tricks you would like to share? google-discuss-l@uncg.edu is a Google Group that allows anyone on campus to post and participate in discussions about Google Apps @ UNCG. The membership is open to anyone who wants to subscribe, and is intended to encourage discussion about best practices, success stories, and ways in which the university community can make use of this collaboration suite. Login with your iSpartan Username and Password. Click the Join Group button.